So far, in MSR’s survey of the music of Barbara Harbach, vocal music has been conspicuously absent, an oddity, to say the least. After all, apart from the music recorded here, Harbach has written a musical, Booth! (concerning the brother of John Wilkes) which played in New York last summer, and an opera, O Pioneers!, based on the novel by Willa Cather, was given in St Louis last October. Unfortunately, although O Pioneers! was broadcast on KFUO St Louis - (which was available on the internet - if you missed it that was it.) It’s a fine work, which needs repeated hearings to really get into the piece, so one can only hope for a national broadcast at some time, and thus a worldwide audience could hear the work. Until then, here are seven vocal works, which show the range of Harbach’s vision. Abigail! - Harbach seems to favour the exclamation mark in the titles of her vocal works! - sets words from letters between Abigail Smith Adams and John Adams, the second President of the USA. Voice and harp make such a good combination, and here they are complemented by wind and strings – it’s a beautiful piece of vocal chamber music, well laid out for a small ensemble, colourful and understated. Pleasure Flow, Tender Mist sets words by Jonathan Yordy – who wrote the libretti for both her musical Booth! and her opera – and they are eminently singable words – not always the case with contemporary verse. These are also very singable songs. Relaxed and tender, they would grace any recital. Emily! sets words by Emily Dickinson and who would have thought that the combination of soprano, trumpet and piano would work so well together! Dickinson the mystic is here treated to music of ecstatic fervour which, due to the e trumpet, still has its feet on the ground, planted firmly in the real world. Harbach’s seeming simplicity – like Copland’s in his Dickinson settings – heightens the emotion and passion of the words. Perhaps the use of trumpet will militate against too many performances so we must be grateful for this recording. Pioneer Women: From Skagway to White Mountain sets words from four women who “helped settle the wilds of Alaska”. This is the longest work on the disk and it’s more dramatic and visionary than the other pieces. But it’s not without a sense of fun. With clarinet added to voice and piano, it is a major addition to the repertoire for this combination of instruments. The final three short pieces are delightful make–weights. Light Out of Darkness sets words by Helen Keller; it’s a simple, ecstatic chant. Cherish – Caress is a duet for voice and cello, setting more words by Yordy, which is a fine essay in how to write a really “singing” vocal line. The poem, however, is rather twee and somewhat cringe–making. Finally, Twenty–First Century Pioneer, is a blues, delivered in a lovely Southern style, with a down–home drawl. Great fun. 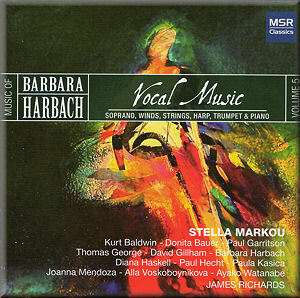 It says much for the strength of Harbach’s work that she has created vocal music which builds on the two great American composers for the voice – Ned Rorem, who has probably done more for vocal music in the past sixty years than anyone, and Aaron Copland, whose 12 Poems of Emily Dickinson might just be the greatest American composition for voice and piano – yet manages to find her own truly American sound. As I have said before, when I have had the great pleasure to report on the previous four CDs of her music, she has forged a voice which is all her own, yet speaks clearly in the American vernacular. Don’t miss this disk for it is something very, very special. The performances are excellent, committed and vibrant – Stella Markou knows how to use her voice to best effect, and although rather limited in her range of vocal colour, she makes up for it in insight into the music – in excellent sound and with good notes in the booklet.